Geochemistry is a science that is based on an understanding of chemical processes in the earth. One of the principal tools available to the chemist for understanding systems at equilibrium is thermodynamics. The awareness and application of thermodynamic techniques has increased at a very fast pace in geosciences; in fact, one may be so bold as to say that thermodynamics in geology has reached the "mature" stage, although much future thermodynamic research is certainly needed. However, the natural processes in the earth are often sluggish enough that a particular system may not reach equilibrium. This observation is being supported constantly by new experimental and field data available to the geochemist e.g. the non-applicability of the phase rule in some assemblages, the compositional inhomogeneities of mineral grains, the partial reaction rims surrounding original minerals, the lack of isotopic equilibration or the absence of minerals (e.g. dolomite), which should be present according to thermodynamics. The need to apply kinetics has produced a large number of papers dealing with kinetics in geochemistry. As an initial response to this growing field, a conference on geochemical transport and kinetics was conducted at Airlie House, VA, in 1973, sponsored by the Carnegie Institution of Washington. The papers there dealt with several kinetic topics including diffusion, exsolution, metasomatism and metamorphic layering. Since 1973 the number of kinetic papers has continued to increase greatly. Therefore, the time is ripe for a Short Course in Kinetics, which brings together the fundamentals needed to explain field observations using kinetic data. 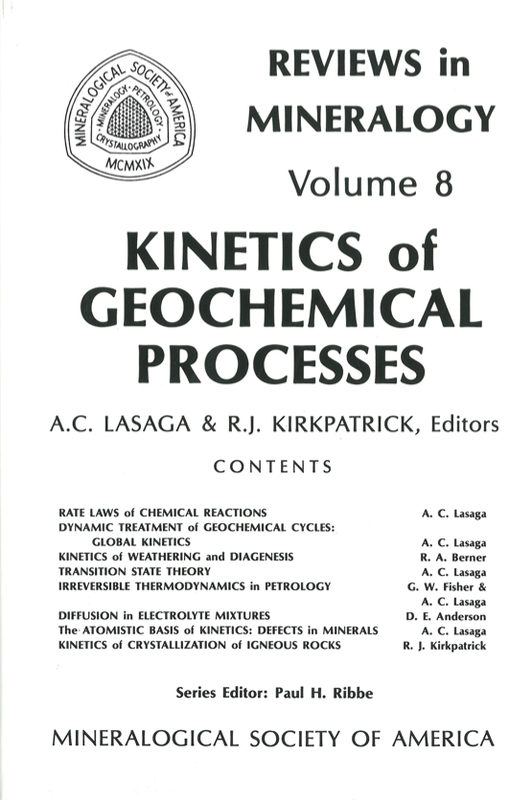 It is hoped that this book may serve, not only as a reference for researchers dealing with the rates of geochemical processes, but also as a text in courses on geochemical kinetics. One of us has found this need of a text in teaching a graduate course on geochemical kinetics at Harvard and at Penn State during the past several years. Finally, it is our hope that the book may itself further even more research into the rates of geochemical processes and into the quantification of geochemical observations. The book is organized with a rough temperature gradient in mind, i.e. low temperature kinetics at the beginning and igneous kinetics at the end (no prejudices are intended with this scheme!). However, the topics in each chapter are general enough that they can be applied often to any geochemical domain: sedimentary, metamorphic or igneous. The theory of kinetics operates at two complementary levels: the phenomenological and the atomistic. The former relies on macroscopic variables (e.g. temperature or concentrations) to describe the rates of reactions or the rates of transport; the latter relates the rates to the basic forces operating between the particular atomic or molecular species of any system. This book deals with both descriptions of the kinetics of geochemical processes. Chapter one sets the framework for the phenomenological theory of reaction rates. If any geochemical reaction is to be described quantitatively, the rate law must be experimentally obtained in a kinetically sound manner and the reaction mechanism must be understood. This applies to heterogeneous fluid-rock reactions such as those occurring during metamorphism, hydrothermal alteration or weathering as well as to homogeneous reactions. Chapter 2 extends the theory to the global kinetics of geochemical cycles. This enables the kinetic concepts of stability and feedback to be applied to the cycling of elements in the many reservoirs of the earth. Chapter 3 applies the phenomenological treatment of chapter 1 to diagenesis and weathering. The rate of dissolution of minerals as well as the chemical evolution of pore waters are discussed. The atomistic basis of rates of reaction, transition state theory, is introduced in Chapter 4. Transition state theory can be applied to relate the rate constants of geochemical reactions to the atomic processes taking place. This includes not only homogeneous reactions but also reactions that occur at the surface of minerals. Chapter 5 discusses the theory of irreversible thermodynamics and its application to petrology. The use of the second law of thermodynamics along with the expressions for the rate of entropy production in a system have been used successfully since 1935 to describe kinetic phenomena. The chapter applies the concepts to the growth of minerals during metamorphism as well as to the formation of differentiated layers (banding) in petrology. Chapter 6 describes the phenomenological theory of diffusion both in aqueous solutions and in minerals. In particular, the multicomponent nature of diffusion and its consequence in natural systems is elaborated. Chapter 7 provides the atomistic basis for the rates of reactions in minerals. Understanding of the rates of diffusion, conduction, order-disorder reactions or exsolution in minerals depends on proper description of the defects in the various mineral structures. Chapter 8 provides the kinetic theory of crystal nucleation and growth. While many of the concepts in the chapter can be applied to aqueous systems, the emphasis is on igneous processes occurring during crystallization of a melt. To fully understand both the mineral composition as well as the texture of igneous rocks, the processes whereby new crystals form and grow must be quantified by using kinetic theory. Due to space and time limitations (kinetics!) some topics have not been covered in detail. In particular, the mathematical solution of diffusion or conduction equations is discussed very well by Crank in his book, Mathematics of Diffusion, and so is not covered to a great extent here. The treatment of fluid flow (e.g. convection) is also not covered in the text. This volume, Kinetics of Geochemical Processes, is the first in the Reviews in Mineralogy series to be process-oriented. It was the brainchild of David R. Wones, who overheard Tony Lasaga and Jim Kirkpatrick talking about a book they were preparing to write on the subject. They were persuaded to convene a short course at Airlie House near Warrenton, Virginia on May 22-24, 1981, which was received with considerable enthusiasm.